Vancouver based Delrey Metals (FRA: 1OZ – CSE: DLRY) have announced this morning that they’ll be expanding their operations in British Columbia (Canada) with 2 exciting new properties added to their roster. Delrey have struggled in a highly competitive market since their first IPO on October which raised C$1.5 million for 7,500,000 common shares in the capital of the Company at C$0.20 per Share. As of Thursday 6th December, their share price was 8.3% down in Frankfurt and was still 5.9% overvalued according to basic simplywall.st analysis. With volatile market reactions investors may have been wary of this younger venture team exploring early stage battery metals projects, but I think they’re definitely worth a second look. Morgan Good (Founder, President, CEO & Director) is not the classic greying Wall St. crash veteran that market analysts still seem to bound towards, but we’re in a modern market. Miners right now are competing directly with modern crypto and cannabis industries for money. We’re looking for modern minerals with modern technology. I think a slightly fresher face should be seen as a big bonus. Morgan has been involved with mining finance for 15 years and is no stranger to BC exploration projects. He was a founding member of Patriot Capital, as well as being current CEO & Director of ALQ Gold Corp. (CSE:ALQ) which has raised ~$20M since August, 2017 and increased its share price by c.3.6 times listing price since IPO. Morgan has raised over $40 million for projects in recent years. Leighton Bocking was previously the Manager of Corporate Development at Gold Standard Ventures Corp. and has worked in a Corporate Development role at Timmins Gold Corp. During his time there, these mining resource companies raised in excess of $100M. Alastair Brownlow is the company’s newly appointed CFO. He is an experienced junior mining audit accountant. The Sunset Co-Cu prospect is just north of Whistler making access development potential reasonably simple, all be it seasonal (unless you enjoy cross country skiing with 40kg of samples in your pack!). The licence area was first moved on by Rio Tinto in the 1970s with the identification of Lower Cretaceous Gambier Group volcanics, which are host to the renowned Britannia high-grade Cu-Zn VMS mine. The area was drilled in 1991. It has seen historic ground magnetic surveys, surface mapping and grab sampling campaigns. While nothing has been formally discovered yet, Delrey are targeting VMS type (similar to nearby Britannia) and vein and replacement type gold-silver deposits (similar to nearby Northair or Brandywine). They’ll be spending around C$165,000 assessing areas adjacent to the geochem and geophys anomolies found in historic data. In this early stage, Sunset has nothing to write home about, that’s its beauty. It’s a complete unknown with promising geology and in a strong location. I think it was certainly worth a dive into at IPO for the ever-optimistic retail investing crowd. This morning Delrey announced acquisition of 2 new licences on Porcher Island, in the Skeena mining division of BC, southwest from Prince Rupert. The properties are accessible year-round by float plane, helicopter, ferry or charter launch along the Oona River from Prince Rupert. Active barge-logging is underway within the project area, which has created a network of logging roads to the northwest and southeast allowing for low-cost exploration and development. The property consists of 7 tenures covering 3122.16 Ha and is open for expansion in multiple directions. The high-grade gold Surf Point Mine, located on the northwest corner of Porcher Island approximately 9km from the Porcher Property, operated from 1919 through to 1939, before shutting down at the onset of WWII. The property is host to two north-south trending gabbro dykes hosting iron-titanium-vanadium (Fe-Ti-V) mineralization within massive titaniferous magnetite. The dykes are mapped at surface as being 5.2km x 1km and 4km x 0.6km. These dykes are coincident with a large magnetic anomaly identified in the historic Resources Canada Corp. 200m Residual Total Magnetic field dataset. Limited sampling by McDougall (1961) was completed over these gabbro bodies with concentrate results ranging from 0.3% to 1.5% Ti and 0.2% to 0.5% V (0.34% to 0.84% V205). A report by the United States Geological Survey (Fischer, 1975), based on limited surface sampling work, estimated that a medium sized resource exists on Porcher Island with an ore grade of >25% Fe, 2% TiO2, and 0.2-0.35% V205 with a magnetic concentrate grade of 60% Fe, 0.3-1.5% TiO2, and 0.3-0.9% V205. This property consists of 4 tenures covering 3646.8 Ha and is open for expansion in multiple directions. The Star property is located in a historic mining district. ‘at least several hundred thousand tons of magnetite-bearing rock with a grade of the order of 35% iron exist within the drilling area’ (PF671671). 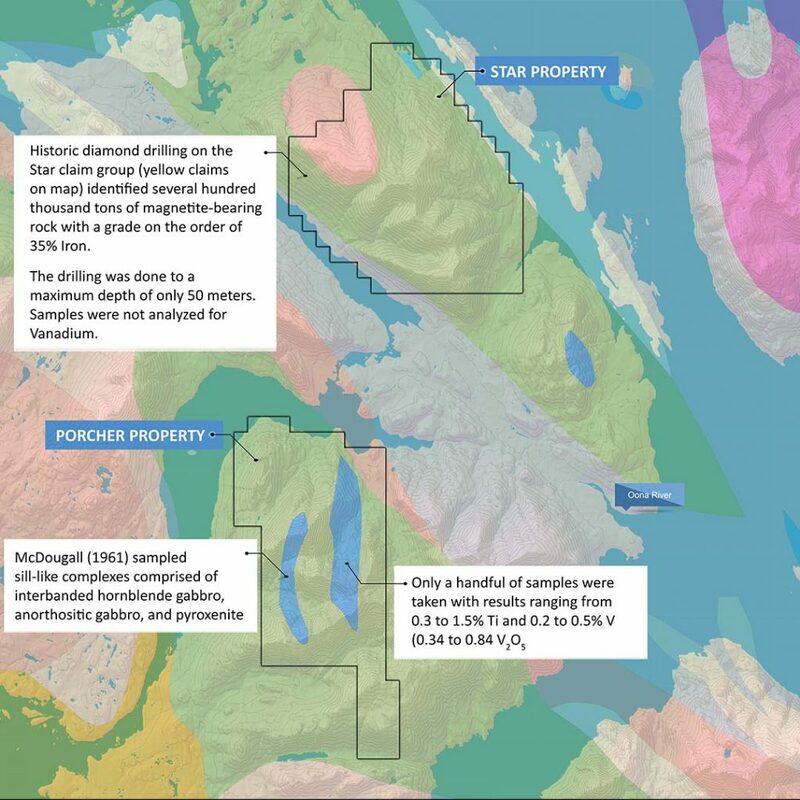 The One Resources Canada Corp. 200m Residual Total Magnetic field dataset highlights a 5km x 7km magnetic high located in the center of the Star claim group. Historic drilling was completed on the far eastern flank of this magnetic anomaly indicating that a much larger resource potentially exists within the property area to the west. While the historic drill program did not analyze the magnetite for Vanadium, a Regional Geochemical Survey (RGS) was completed by the British Columbia Geological Survey in 2000 over the Star claim group which highlighted up to 148ppm vanadium-in-silt (99th percentile) and 5.06% Fe. These impressive RGS results tap drainages that flank the large magnetic anomaly along its multiple sides. Delrey have hinted that they have some tricks up their sleeve yet to play. These two new properties are expected to be joined by more stakes this winter season. The team have only just begun their exploration work on-site and we’d really like to see some strong results at surface, after a mixed year for the CSE and entry level projects in Canada. The first new maps and geological analyses are expected from Porcher in 2019 and if it looks good, drilling will surely follow. I’m quite excited by the Porcher properties, I have a soft-spot for unravelling complex geology at start-up projects from mystery through to a classic geological model. If Delrey publish their findings, these licenses will give us a great set of constraining data within the gabbro and greenshist metamorphosed fascies across Porcher Island (MAP) that could lead to significant expansions for them as an explorer as well as some material for us to salivate over as geologists. I’ll make sure hassle the team for models, data and images as they’re being developed and be sure to keep you updated, as best we can. This is an original article for MiningIR.com by Liam Hardy. This article was not paid for by any shareholders or employees of Delrey Metals or their subsidiaries. MiningIR are an independent media group and do not own shares of have financial interest in Delrey Metals or their subsidiaries.